10 Best Beaches Around The Globe For Your Next Vacation! Summer goes synonymous with vacation and beaches. Still deciding where to head with your sunscreen and shades? Here's a list of top ten best beaches filtered from all over the world to help you choose the perfect summer spot for yourself! One of the most visited secret beaches in the world, this beach in Mexico is famous for the unusual landscape it presents. It was formed in 1900 when the Mexican government blasted a huge canopy which gave shape to a cavern. It is a humongous hollow uniquely shaped into a beach makes it one of the best beaches in the world and would make an amazing first entry in your travel log. The bioluminescent beach in Maldives is known for the ethereal vista it presents to its visitors. The microscopic bio luminescent phytoplankton present in the waters of this beach gives the sight of a beautiful starry night as they light up when there is motion in the surface water. The beach of Cathedrals, as the name suggests is full of Cathedral like arches which make the beach stand out among all its counterparts. So reserve another spot in your travel log and head to this spot for rejuvenating and channeling all your positive vibes! Ahan, you read that right. There is, indeed a lot of beauty in this world. The Pink Sand Beach in the Bahamas is yet another example of this. The sand of this beach is full of washed up coral remnants which when mixed with the sand give it a pink reminiscence and light up the beach in a beautiful coral color! The reason why Jokulsarlon in Iceland is in the list of best beaches is because of its unique black sand and equally magnificent contrast of white, glassy chunks of ice against it. The black color is due to volcanic remnants which have cooled down over the time to impart a dark texture. Not every time does a bad intention result in something disastrous. The best example of this saying is the glass beach in California. It was formerly a dumping ground for waste before the water at the shore washed away the broken pieces and created miniature colorful glass trinkets. So buckle up your beach essentials and get your girl gang ready! You'll fall for the glassy texture of the beach that lights up the whole scene to make it the most vibrant vacation spot. The shore of this beach in Orissa literally expands up to around 5 km twice a day, at the time when the sea recedes backward in the occasion of a low tide. Within India, this is one of the best beaches that you could opt for a vacation. You can take a leisurely walk right on the sea bed and collect shells as souvenirs to take back home. Only take care to return before the next high tide! This beach in Australia is a part of the Shark Bay UNESCO world heritage sites. Talking of collecting shells, you would get the absolute abundance here as the whole shore is covered with sea shells. 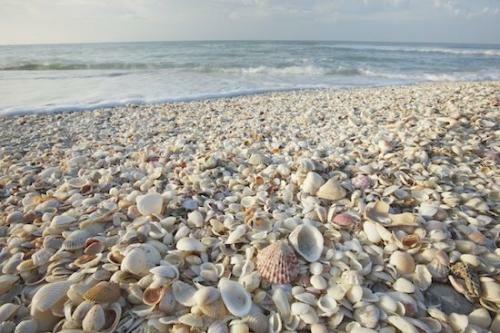 The shells form such a canopy that it is difficult to spot the sand! Also, located near the beach is the Old Pearler Restaurant, which is entirely made up of shells. What could be better than a good swim and the best drinks to complement it? Hyams beach is actually a seaside village in the city of Shoalhaven, Australia. It holds a place in the Guinness Book of World Records for having the whitest sand of all beaches. A wanderer in this beach will spot a plethora of rock arts, artifacts, and grooves. The shore of the Bowling Ball beach in California is full of huge rocks perfectly weathered to resemble the shape of large bowling balls. These spherical rocks which give an impression of the most beautiful sea shore are the reason why this spot is one among the best beaches in the world. Nothing better than the sea to release you of all your stress. So what are you waiting for? Grab your beach essentials and get on board to visit these extraordinary beaches to spend your summer!